DIAMOND DELUXE Y-Style is designed to widen out above the wheel wells to give more storage space. 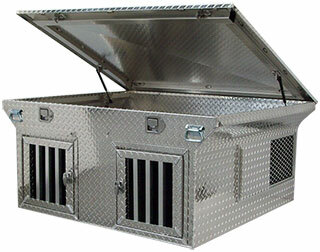 Made with welded diamond tread aluminum it features carrying handles, locking full top storage, locking T-handles on the dog doors, corrugated plastic insulation on all exterior walls, solid aluminum divider panel, dual gas struts, all locks keyed alike, flat lid and slide covers on the vents. 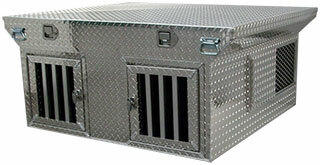 DIAMOND DELUXE units have the largest vents of any dog box with the vent measuring 10 ½” x 14”. These units are extremely lightweight with the large truck box weighing only 115#. Available in 54” and 46” widths and 46” and 38” length. Available in 2-Dog or 3-Dog. Options: Flush mount latches, winter door panels, rear vents, roof rack, 12-volt fan, punched divider and top storage divider. We can custom build to any size.